Located in SOMISSPO (a hubcap roll from the freeway) at 119 Utah Street, this 7,000 square foot space offers world class DJs, dancing, live bands, and just about every other sort of performance under the sun. 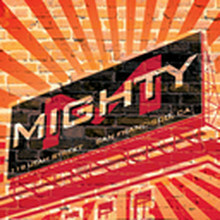 Mighty is making its home in a turn-of-the-century brick warehouse, with 22' ceilings and huge, beautiful wood beams throughout. There are three bars, including a 30' all steel main bar and a frozen vodka bar in the back room, several lounge areas, and the latest in projection and lighting design. The sound will be pumped out of the classic Richard Long sound system from 177 Townsend, lovingly restored by Greg and Jake of Ultramagnetic. The physical aspects of the space aside, the tone at Mighty shall be set by the rotating art work. Charles Linder, of local favorite LINC, will be curating the gallery side of this venue.